Prime Minister Abe Shinzo’s visit to Washington produced major developments in Japan-US relations, particularly security relations. A new set of defense guidelines was announced that opens the way for Japan to expand its defense role and capabilities in order to provide more direct military support to the United States under a Japanese doctrine of collective self-defense. Abe and President Barak Obama signaled a closer personal relationship and agreement on a range of key issues. The only dark cloud was the continuing issue of Japan’s history. Abe made several statements about Japan’s record during the Pacific War (1931-1945). Some drew positive US reactions, including his references to the sacrifice of Americans who died in World War II for the cause of “defending freedom,” and his acknowledgement that “our actions brought suffering to the peoples in Asian countries.” Abe also promised to “uphold” the Kono and Murayama statements. However, a number of American analysts reacted that Abe fell short on the “comfort women” issue—of acknowledging the responsibility of the Japanese government and military of that time and the historical accuracy of the Kono statement. These critical evaluations were mild compared to the South Korean reaction. ROK officials not only criticized Abe for not acknowledging the responsibility of the Japanese government and military for the “comfort women” system, they also reproached him for not issuing an apology to the survivors (several American critics also demanded an apology) and indicated that ROK-Japan relations would remain cool until Abe abided by their agenda. Another worrisome South Korean reaction was the publicized statement of four prominent civic groups, which warned that if Japan continued to evade acknowledging its “criminal” past, “US leadership may face corresponding challenges.”1 Abe’s visit was seen through a triangular prism, as ROK reactions were closely followed. These reactions symbolized the US difficulty in promoting trilateral cooperation on East Asian security issues, especially North Korea. The key question is whether the dispute over history, especially “comfort women,” will turn into a fundamental enmity between South Korea and Japan. Such an enmity could produce new challenges for both countries and for the United States: future military tensions between Japan and South Korea over their territorial dispute, especially if oil or natural gas should be found near the islets; future negative South Korean and Japanese reactions to US policies to increase defense cooperation with the other party; a South Korean drift into China’s orbit on security issues; growing pressure on the United States by both Seoul and Tokyo to take positions against the other party; and a weakening of the US alliances with one or both. The United States, in short, faces potentially mounting challenges in relations with both allies. The movement to revise Japan’s history during the Pacific War has long existed; however, two catalysts in the 1990s resulted in its growth: the emergence of the “comfort women” issue; and pressures on Japan, especially from the United States, to expand its defense capabilities and responsibilities. History revisionists seized on these pressures to argue that Japan needed to change the post-World War II pacifist public attitudes to become a “normal nation,” including a normal defense policy no longer shackled by Article 9 of the postwar constitution, the so-called “no war” clause. One goal was to refute the perception of Japanese guilt in the operation of the “comfort women” system. This meant rescinding the initial steps of the Japanese government in the 1990s to assign responsibility for the system to the government and military of that time, describe the coercive nature of the system, and offer atonement to survivors. The government issued the Kono statement in 1993 and joined with private parties in 1995 to create the Asian Women’s Fund to offer financial compensation to survivors. In 1995, Prime Minister Murayama issued a statement apologizing for Japan’s aggression and colonial rule toward other East Asian peoples. Since then, a key revisionist goal has been to rescind the Kono statement, affirming instead that the system was not coercive and that the Japanese military was only indirectly involved in organizing and operating it. The revisionists have broadened their agenda. They more openly criticize the war crimes trials, which the allied powers conducted after World War II. They challenge the predominant view of the 1937 “Nanking Massacre” of Chinese civilians by Japanese troops. They emphasize the need for Japanese political leaders to visit the Yasukuni Shrine, where Japan’s war dead are enshrined but also where 13 of the Class A war criminals from the Tokyo War Crimes Trial are enshrined. The history revisionists also press hard for removal of Article 9 from the Constitution and have proposed other constitutional changes involving political and civil liberties and the status of the emperor. Another prime objective has been to change the accounts in history textbooks of Japan’s policies and practices during the Pacific War. Finally, the revisionists publicize Japan’s claims to “Takeshima” and call for a more assertive Japanese policy toward South Korea. All of this not only affects US confidence in Japan, it reverberates in US sympathy with South Korea’s more visceral distrust of Japan and US concern over trilateral security ties. Abe’s relations with the history revisionists have intensified the challenges presented by this issue. He repeatedly expresses doubts about the accuracy of the Kono statement’s description of the “comfort women” system as coercive. As shown by his recent statements in Washington, he is reluctant to assign responsibility for the system to the Japanese government and military of that time. He also has encouraged the revisionists by visiting Yasukuni Shrine and has given revisionist-leading officials in the Education Ministry room to modify history textbooks. Abe, however, stops short of endorsing their full agenda. His statements in Australia in 2014 and now in Washington display an unwillingness to challenge the allied view of abusive treatment of prisoners of war, the justice of the Allied cause, and the validity of the war crimes trials. But this reluctance applies mainly to the United States, Australia, Great Britain, and the Netherlands, less so to South Korea where the history issues reflect differences from the allied countries. South Korea’s rejection of the Japanese history revisionists and of Abe’s encouraging gestures to them has focused primarily on the “comfort women” issue, many of whom were Korean. It particularly criticizes the assertions that the system was not coercive, seen as symbolizing unwillingness to acknowledge the overall severity of Japanese colonial rule over Korea from 1905 to 1945. It is also, some South Koreans argue, a warning that there are forces that could turn Japan towards re-militarization and a repeat of its historic abuses of its neighbors. South Korea also uses its version of earlier history (the nineteenth century and 1904-1905) to support its claim and current control over “Dokdo,” rejecting a longstanding Japanese proposal to take the dispute to the International Court of Justice. Rejection of Japanese history revisionism has gone beyond these substantive issues. President Park Geun-hye and Xi Jinping jointly have criticized Japan and may agree to a joint ceremony in August-September 2015 commemorating and celebrating Japan’s surrender in 1945 and the collapse of the Japanese Empire. China does have legitimate concerns about claims made by the Japanese history revisionists, but China also appears to have a broader objective of gaining South Korea’s support for China’s positions toward Japan and the United States on current security issues. There is a common view among American analysts that South Korean politicians have exploited the Japan history issue for internal political gain. Government and non-government institutions have an apparent policy of either ignoring Japanese measures that do acknowledge Japan’s historic wrongdoings and seek to atone for them, or asserting that such measures are insufficient. This has included lukewarm (at best) support for the Kono statement; a rejection of Abe’s 2014 investigative commission even though the commission found that the Kono statement is historically accurate;2 ignoring the Emperor’s visit to Saipan in 2005 when he laid a wreath at a memorial for Koreans who died during the 1944 battle for Saipan; and rejecting and expelling the Asian Women’s Fund from South Korea in the late 1990s. South Korea also has picked fights with Japan on other issues. One is an aggressive challenge to the general international recognition of “Sea of Japan,” demanding recognition of the name “East Sea.” Another is South Korean criticism of Abe’s recent diplomatic initiatives toward North Korea in an effort to resolve the case of Japanese who have been kidnapped by North Korea. The impact of South Korea’s responses has been to freeze Japan-South Korea relations. It opposes improving defense cooperation, although it agreed in December 2014 (no doubt under US pressure) to a tripartite agreement on intelligence exchanges with the United States acting as the conduit of information between Seoul and Tokyo. In effect, Seoul opposes Abe’s defense policy of collective self-defense; but because of US support for Abe, it has modified its opposition into voicing specific concerns and suspicions. The government calls for assurances from Japan and the United States that Japanese troops will never set foot on the Korean Peninsula unless South Korea approves it. A recent three-party defense meeting issued such an assurance, but South Korean officials have indicated that future discussions of this issue will be necessary. Ignoring/downplaying positive Japanese acts and “picking fights” have worsened the situation. The history revisionists increasingly have defined the “comfort women” issue as a dispute only between Japan and South Korea, using South Korean policies to argue that Japan never will be able to satisfy it on the history issue and that it always will demand more regardless of what Japan does. Therefore, the revisionists say, Japan should make no concessions to Seoul. That argument has gained credibility with the public. The term “Korea fatigue” is used to describe the Japanese public’s increasingly negative attitude toward South Korea. Since the Japan history issue gained prominence in the 1990s, successive US administrations have followed a policy of neutrality and minimal involvement in the substantive issues. Officials have confined public statements to urging Japan and South Korea to lower the importance of history and cooperate on current security issues. Publicly and privately, they have avoided interjecting US judgments on issues such as Dokdo-Takeshima and the coercion or non-coercion of “comfort women,” remaining silent too in response to assertions of history revisionists regarding US-related history, such as the treatment of prisoners of war and the allied war crimes trials. The major exceptions have been reported private entreaties to the Abe government that it should not change the Kono statement and the Obama administration’s expressed “disappointment” over Abe’s visit to Yasukuni Shrine. There also have been a few statements deploring the “comfort women” system and hinting at unhappiness over South Korea’s tactics. The policy of neutrality and minimal involvement stems from a priority on current security issues, especially stressed by the Pentagon, but another factor appears to be fear, especially in the State Department, that greater US involvement would antagonize Seoul or Tokyo. Running through the US bureaucracy appears to be a bias against the importance of history in current state-to-state relations, indicated in repeated State Department and White House avoidance of dealing with other historical issues, such as President Putin’s repeated historical justifications for his aggression towards Ukraine, the post-World I state boundaries in the Middle East, and the annihilation of Armenians by the Ottoman Empire during World War I. A US initiative would need to be intellectually and historically accurate. Firmer judgments on individual disputed issues would take sides between Japan and South Korea, but a credible policy would not take one side exclusively. Primarily, a balanced policy would strongly challenge the substantive agenda of Japanese historical revisionism but expand US security support for Japan, and it would challenge a number of the tactics employed by South Korea against Japan. Such a policy should involve not only the US government, including Congress, but also private “think tanks” with influence. – On comfort women, praise the measures of the Japanese government in the 1990s; state a US view that the Kono statement is “historically accurate,” including its references to coercion; urge Abe to make a similar statement affirming its historic accuracy; acknowledge and praise other Japanese actions that support historic accuracy. – If necessary, present an analytical US view of the coercion issue, defining the types of coercion (physical abduction, deception to lure women from their homes with offers of legitimate jobs or education, and forced confinement in “comfort stations” and Japanese military bases). – If Abe again visits Yasukuni, do not flatly oppose such visits but call for Abe to affirm the legitimacy of the Tokyo War Crimes trial and reaffirm the clause in the 1951 Japanese Peace Treaty, acknowledging its legitimacy. – Increase outreach to the Japanese public over US support for Japan adopting collective self-defense, pointing out that revising history is not necessary to support this. – Continue affirming the defense commitment to Japan regarding the Senkaku islands. Urge Japan to propose taking the issue to the International Court of Justice (ICJ); and praise Japan for its standing proposal to take the Dokdo-Takeshima dispute there. Warn China that if it continues aggressive actions in the East and South China seas and to reject third party involvement in these disputes (i.e, the ICJ and the Law of the Sea Tribunal), the United States will consider recognizing Japanese sovereignty over the Senkakus. – State and demonstrate that the United States will support legitimate South Korean criticism of Japanese history revisionism, including comfort women coercion and the historic accuracy of the Kono statement. – At least privately criticize South Korea for dismissing Japanese positive acts and remind it of past instances of ignoring or downplaying positive statements and actions, which plays into the hands of the Japanese history revisionists. – Emphasize that it ought to ensure that any ROK-China declaration on the seventieth anniversary of Japan’s surrender should contain a specific reference to the crucial US role in ending the Pacific War and liberating both South Korea and China. – Initiate a report by the State Department Historical Office on why the United States did not include Dokdo among the islands whose sovereignty was designated in the Japanese Peace Treaty. Abrogate the Rusk statement of 1951 that Korea did not have a claim to Dokdo prior to 1905 in view of the recent discoveries of Japanese official documents from the 1870-1880s in which Japan’s government stated that the islets belonged to Korea. – Defend historically and intellectually the US government’s policy of designating “Sea of Japan” on US maps, but have US officials use “East Sea” when in South Korea. – Strongly defend South Korean support of Abe’s policy of collective self-defense, but promote a process in which Japan will assure South Korea that no Japanese troops would be deployed on land in the Korean Peninsula without the consent of South Korea (realizing the need for discussions of other types of Japanese military power that could be directed into Korea). The Abe visit to Washington raises the urgency of addressing these issues in the US government and influential think tanks, altering the one-sided discourse and bringing a balanced debate into being in both Japan and South Korea. This visit drew attention to the triangular challenge that is overshadowing US-Japan relations. Facing this squarely appears to be the necessary first step towards compromise and resolution of the Japan history issue and restoring normal relations between South Korea and Japan. 1. 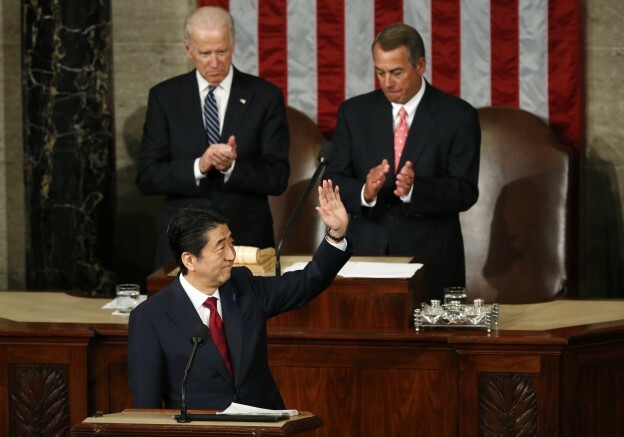 “Civic groups call for US action over Abe’s speech,” The Korea Herald, April 28, 2015. 2. Government and non-government institutions criticized the commission for revealing South Korean-Japanese discussions prior to the issuing of the Kono statement and ignored the positive finding of the commission that the statement is historically accurate.